Voor de vaste lezers: Ik schrijf dit in het Engels, omdat er veel vraag naar dit soort oplossingen is. Eversince Roland introduced the GR midi guitar systems, I wanted to have one. Being a strat-man, off course I wanted to have the G-505, as a lot of my admired guitarists did. Here in the Netherlands, ‘world famous’ guitar players such as Jan Akkerman, Sander van Herk and Jan van der Meij all played one. Unfortunately, being a student living alone in Amsterdam has it’s disadvantages, one being that I could not afford to buy one. 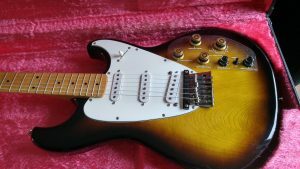 I usually buy my guitars (if I don’t make them myself) second hand from individuals, and recently a G-505 was offered on our national marketplace site. A fully functional model from 1982, without any wear, scratches, dents or whatever. Even the case looked like it had been stowed for 35 years (with a genuine Roland jack cord, still sealed in the original plastic). This one was going to be mine! …and so it did. The only “problem” I had was that the axe was on its own. There was no cable nor a GR-300 synthesizer unit with it. Although the guitar itself is really amazing, with its bright clear sounds, warm neck pickup and with just the right neck thickness, it felt as if it wasn’t complete. How could I use it the way all my idols used it in earlier days. After the GR-300 and the G505 guitar, Roland release one last model, the GR700/G707. A terrible thing!! The synth had more settings and sounds than the GR-300, with the internals identical to the Roland JX-3P, but I cannot imagine having any fun playing a guitar that looks a lot like an AK47 assault rifle. This was the last model with the unique and much-loved 24pin connector. After that, Roland switched over to a more common used 13pin din connector. Later in life, having earned enough money, I bought my first Roland guitar synth, a GR-09, and used my Godin LGXT to drive it since they both had a 13-pin connector. Having explored all the possibilities of the GR-09 and having fitted a few other guitars with a GK2 kit, I upgraded to a GR-55 which was a huge step. Everything the GR-300, and even GR-7oo could do, this one could do a lot better, a whole lot….. 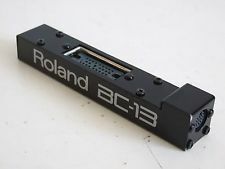 In order to bridge the gap between the old and the new guitar synths, Roland created the BusConverter-13pin, the BC-13. 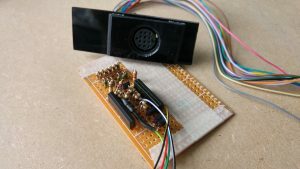 This little device ‘translated’ the signal coming from the 24pin connector into the ones suitable for the 13pin. The huge 24pin connector was connected to the top of the converter, and at the side, the 13pin connector was connected. This had one major advantage: the people who were still using (and won’t stop using) their ‘old’ controllers, would now be able to drive the new synths, replacing the necessary GK1/2 hex pickup systems. Nowadays, the BC-13 is still used by a few people, but is no longer on sale, even on ebay. Some time ago, the schematic of the converter became public, and it appears that Roland had not altered the principle of there pitch-to-midi conversion that much. Thus, the BC-13’s internals are not very complex, I can say with a background of electronics. So, having studied the possible options, I decided to go and build me a BC-13, however with one extra challenge: it should fit in the space of the original 24pin connector of the G-505. It would be a GK-ready strat, with fully functioning 13pin connection, but from an vintage Roland GR. The main point was to have the PCB (circuit board) as small as possible, so it would fit in the space the old connector left. 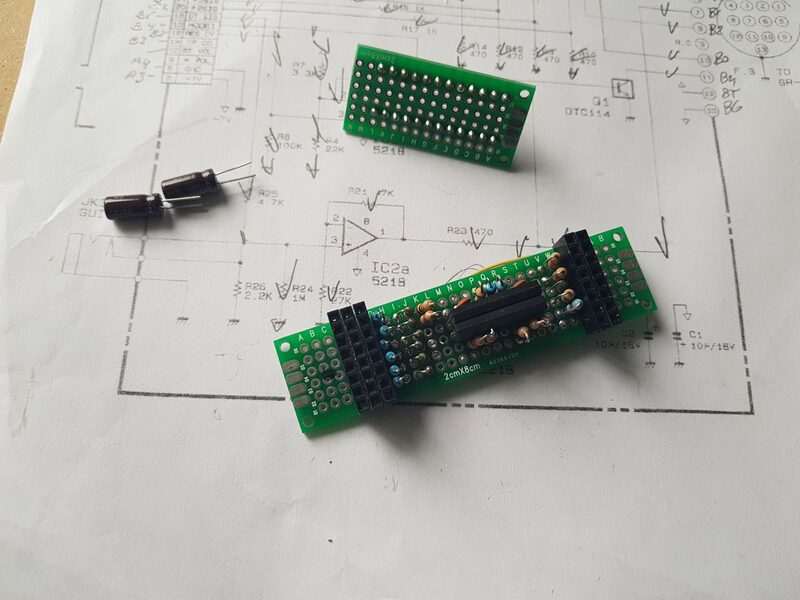 Because the schematics did not contain a lot of discrete components, this was somewhat easy to do, and so, after a few hours with my buddy the soldering iron, I had a working prototype. 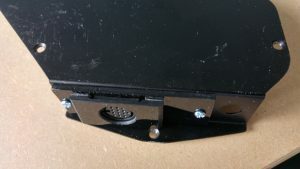 Having spent a few hours in the workshop, I also managed to build a connector plate as well. The 13pin connectors (female) are widely available, and I bought a dozen from my long-time Chinese provider. If this prototype was working, I would rebuild it with more solid parts. 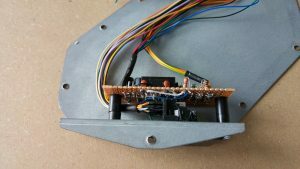 When all was soldered, I managed to construct a connector for the main PCB in the G-505, leaving the guitar in the original state, as much as possible. Having a G-505 to drive a GR-55 is great, but demolishing an 35year old lady is taking this a step to far. No harm should be done to guitars. 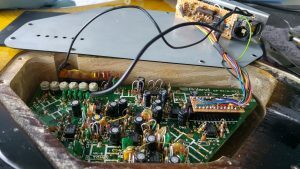 So, at the end of all this, I succeeded in rebuilding the BC-13, and fit it inside a G-505. The original BC-13 had a bare signal from the pickup selector (without volume and tone controls). This version has the full-controlled guitar signal. The GK volume and switches, for switching banks for instance, are working as well. 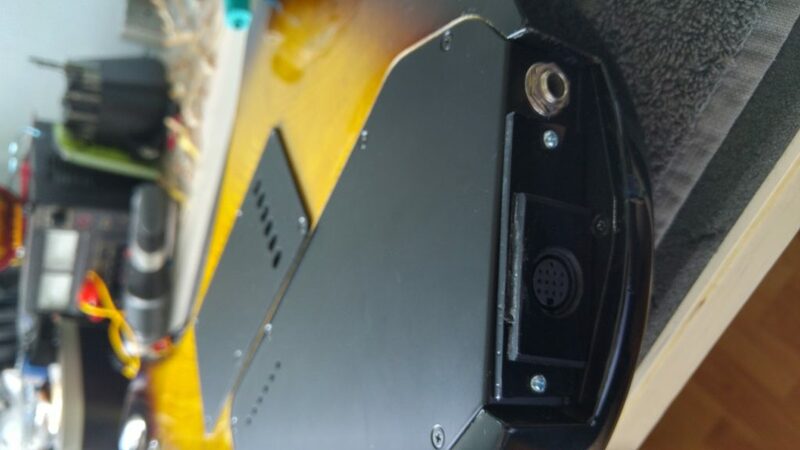 The original design had a blend-function for original pickups and synth signal, but with the GK-55 this can be achieved with setting the GK volume. So, in short, the G-505 now has all the features of the current GK3 interface. See the working interface in action on youtube: The proof it is working. The build proved to be a working version, albeit a prototype. I rebuild a new one, on a more official basis, with real connectors and such. This one features all controls the GK3 has and is completely free of noise.